Human genetically engineered antibodies (red) targeted tumors (cell nuclei, blue) when injected into the blood stream. New Brunswick, N.J. – May 3, 2018 – The development of targeted tools for therapy is a major focus in oncology. A new study by investigators at Rutgers Cancer Institute of New Jersey at University Hospital, Rutgers New Jersey Medical School and colleagues from the University of New Mexico Comprehensive Cancer Center and New Mexico-based Specifica, Inc., describes what they call a “major advance” to a screening technique they pioneered that searches for molecular signatures intrinsic to normal or diseased tissues. The screening process, which can be described as a “molecular mass mailing” to all addresses in the body, employs billions of viral particles, called phage. Initially, the particles were packaged with small fragments of proteins called peptides that act as ligands. When injected into the body, they bind to specific markers. The peptides travel until they find a target and bind to it, then one can recover and identify them. This latest approach elucidates a new strategy to develop anti-tumor monoclonal human recombinant antibodies. The methodology known as SPARTA (Selection of Phage-display Accessible Recombinant Targeted Antibodies) is based on in vivo target receptor identification followed by in vivo antibody selection, using phage/yeast display, deep sequencing, and bioinformatic analyses. The initial studies establish a novel platform that will accelerate the development of antibody-based drugs for general and personalized medicine. Optimizing the delivery of therapeutic or diagnostic payloads (e.g. toxins, drugs, or nanoparticles) and leveraging antibodies that exhibit biologic activity are likely to follow. The proof-of-concept was brought about by initial results published in the current issue of JCI Insight (https://doi.org/10.1172/jci.insight.98305). SPARTA was first tested in animal models with human lung and breast cancers. The team isolated and validated several human genetically engineered antibodies (recombinant), which targeted tumors when injected into the blood stream. 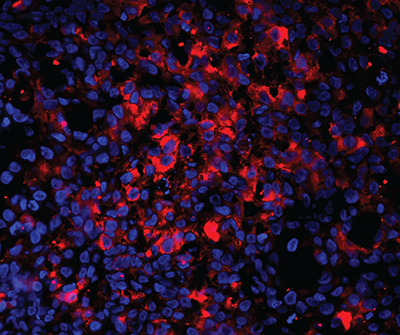 “By applying these recombinant antibodies in mice bearing human tumors, we were able to isolate those that are capable of targeting cancer markers in their native conformation, therefore minimizing the risk of failure in later steps of drug development,” notes co-lead author Fernanda Staquicini, PhD, a researcher at Rutgers Cancer Institute of New Jersey at University Hospital and assistant professor of radiation oncology at Rutgers New Jersey medical school. The authors also showed that recombinant human antibodies isolated with the SPARTA methodology remain functional, which is key. “The antibodies generated in this study can be used as carriers for potent chemotherapeutics, an application that would largely benefit patients suffering from significant side effects of available treatment options,” adds Rutgers Cancer Institute of New Jersey at University Hospital Director Wadih Arap, MD, PhD, who is also the chief of the Division of Hematology/Oncology at Rutgers New Jersey Medical School and another author on the paper. Along with Drs. Staquicini, Arap and Pasqualini, the other authors on the paper are: Sara D’Angelo and Fortunato Ferrara, Specifica Inc.; Daniela Staquicini, Rutgers Cancer Institute of New Jersey at University Hospital and Rutgers New Jersey Medical School; Geetanjaili Sharma, Christy A. Tarleton and Huynh Nguyen, University of New Mexico Comprehensive Cancer Center; Leslie A. Naranjo, Specifica Inc.; Richard L. Sidman, Harvard Medical School and Andrew R.M. Bradbury, Specifica Inc. This work was funded by grants from the National Institutes of Health/National Cancer Institute (R01CA204517), the U.S. Department of Defense (W81XWH-09-1-0224), and the Gillson-Longenbaugh Foundation.